Antipodes Halo Skin Brightening Facial Mud Mask 75g deeply delivers skin-brightening extracts for instant light and lift. It improves your skin’s appearance with antioxidant compound Vinanza® Grape & Kiwi, clinically shown to lighten skin by targeting melanin production. Peony also contributes to a bright and luminous visage by addressing uneven tone. 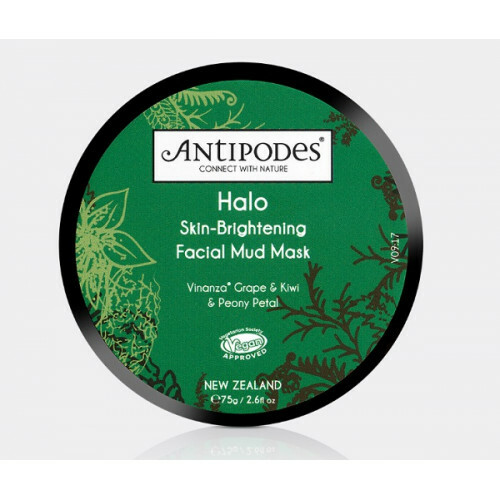 Mineral-blessed volcanic mud from geothermal New Zealand delivers helps to detox your skin. Vinanza Grape & Kiwi helps improve the appearance of skin by targeting redness and pigmentation. and peony flower is prized by the Chinese for centuries for their calming and soothing properties. Volcanic New Zealand thermal mud is full of minerals including sulphur, calcium, sodium and silicon and it provides skin-enhancing properties throughout the ages. Antipodes Resurrect Clarifying Facial Toner 100ml helps reduce the appearance of visual and open por..
Antipodes Worship Skin Defence Antioxidant Facial Serum 30ml is a supreme organic ski..